how can I make the most of my time off? If there is anything these last two years have taught us, it’s that our country is rife with division, miscommunication and misunderstanding. Now, if you read The Sunday Paper on a weekly basis, I’m sure you’re someone who believes, at your core, that we all share similar hopes, values and dreams. But, it can be really hard to see and hear those commonalities if we never leave the comfort of our own homes or communities. Real interactions with real people are what help me feel all of this first-hand. And nothing helps me experience this more clearly than hitting the open road and traveling to American cities and towns that I know very little about. The open road has long held a certain allure in our country. It’s a muse that has inspired great books (On the Road, Travels with Charley), great films (Thelma & Louise, Easy Rider) and great music (from Willie Nelson, to Chuck Berry, to Sheryl Crow). The road is a connecting tissue for this land of possibility and it offers each of us the opportunity to step outside our comfort zones and explore. That’s why I think it’s never been a more important time to take to the open road than now. For years, I’ve spent my breaks and weekends adventuring off to small towns or lesser-known locales simply to see what I might find or experience when I get there. As someone born in Alaska, raised in the South, schooled in the Midwest and employed in New England and LA, I’ve had time to explore outlying areas in many corners of this country. With each road trip, I’ve collected fun photos, quirky souvenirs and rich memories that have furthered my appreciation for America along the way. If you recognize the name San Bernardino, it may be because the city has made national headlines in recent years due to a workplace shooting attack and a bankrupt government. It is, to be fair, a place that is saddled with some real challenges and hardships. But, this is also a community like any other — one that’s made up of hard-working, well-meaning people — and it has more to its story than headlines may suggest. Inside the small lobby of the Wigwam Motel, my friend and I spoke to the owner’s son about why his father bought the inn in 2003 when it was at risk of being torn down. He said that his father saw a business opportunity for his family, but more than that, he saw a chance to preserve one of this town’s few remaining tourist spots. Over the past few years, the family has invested nearly $400,000 to clean up and restore the property. It now lives on as a historic roadside attraction that draws in curious travelers from all over the world. 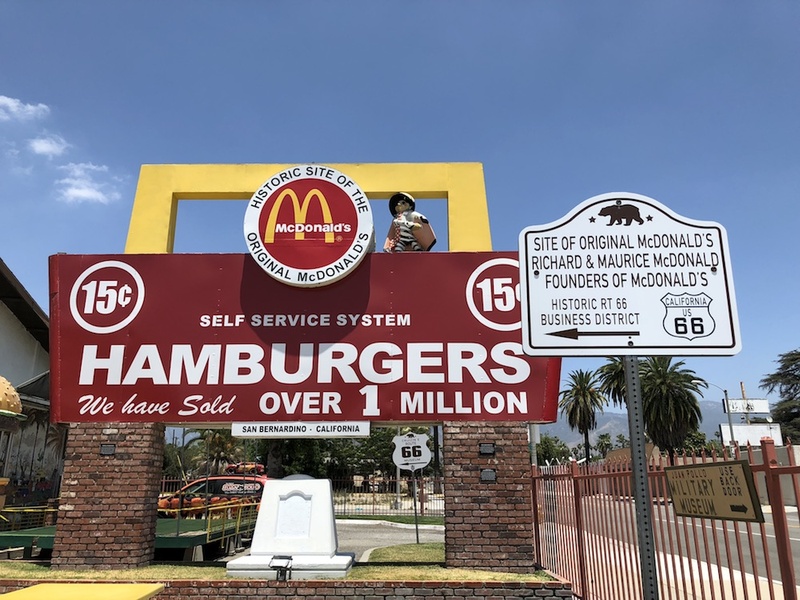 The next day, my friend and I ventured a few miles north to the site of the original McDonald’s. There, an “unlicensed museum” paying tribute to the fast food giant lives on to this day. Jack, the museum’s self-proclaimed curator, greeted us upon arrival and guided us through the years’ worth of McDonald’s memorabilia that they’ve collected and put on display. Everything from old milkshake machines to international Happy Meal toys to original menus and uniforms is housed within this bright small building. Free to the public, the museum has a certain home-made quality to it and feels out of place on its otherwise desolate road. It’s less a business and more a passion project and gift to the community — perhaps even to the world. As my friend and I parted ways with Jack, he eagerly turned his attention to a couple from China who had traveled to town to see the museum. Living in Southern California, I know that I’m blessed to have world-class beaches, mountains and deserts all just a short drive away. But as enjoyable as these places are, I don’t believe that they tell the full story of what this area has to offer (nor do they necessarily need any more attention and tourism dollars). All across America, there are lesser-known cities and towns filled with landmarks and stories that deserve to be seen and heard. One of my favorite quotes about travel comes from Gloria Steinem’s 2015 book “My Life on the Road”, which is less about her legacy as a feminist and more a reflection on the lessons she’s learned from decades of traveling around America. If there was ever a point when we needed to be led out of our heads and into our hearts, I think it’s now. So this summer, I hope you’ll consider taking a drive to a place where you’ve never been — perhaps even a place that you’ve never thought twice about visiting before. If you approach it with a sense of wonder and curiosity, you never know who you may meet or what you may find. Lindsay Wilkes-Edrington is the editor of Maria Shriver’s Sunday Paper. When she’s not working, she’s usually on the hunt for diners, estate sales and roadside attractions.